At the beginning of April, I was in D.C. visiting my friend Elyse. One night we went out to a Mexican restaurant for dinner. Either Elyse or Keith suggested we get sangría. I…was dubious. I “didn’t like wine.” Elyse told me, “It takes better than wine!” So I agreed I’d have a glass. When they brought it to the table it was a pitcher of white wine with tiny apple chunks. I was unimpressed. All the sangrías I had ever seen were overflowing with fruit. I had a glass and it was okay, but made Keith and Elyse finish the rest. A while later, we went to La Casa Narcisi in Gibsonia. Before dinner we did a wine tasting. I initially said no, since I “didn’t like wine,” but then relented. And it turns out? I just don’t really care for red wine. I tried 5 wines and the one I liked the most was Catawba, a semi-sweet blush. After that it was the Niagra, a sweet white. For dinner, Keith’s mom got a bottle of Riesling and I even liked that. We went back the winery another time and did another tasting. This time I tried only whites but still loved the Catawba the best. I drank almost the entire bottle myself and bought two more to bring home. The other day, Keith suggested we make sangría. He is a red fan, so I told him sure, but we had to make white too. 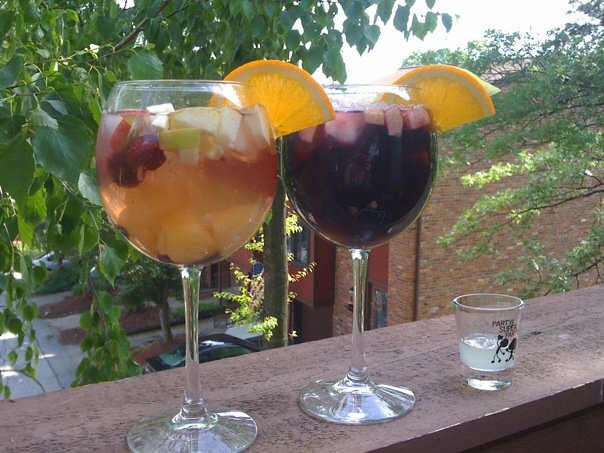 So we bought another pitcher, some wine, some fruit, came home and made MAGIC. I did a ton of googling and ended up using the same recipe for the sangría and the sangría blanca. The amazing thing about sangría is you can add or subtract whatever you like! Keith used a bottle of Tempranillo, I used Riesling. Dump the bottle of wine into a pitcher. 9. Sit on the porch and LOVE YOUR LIFE.